Let me set the scene for you. You and a group of friends head out to the newest hip local restaurant in your hometown. You walk into the airy and whimsical space, soft on trend music is playing in the background. You cozy up to your table and take a look at the single page menu; it was freshly printed that morning featuring local seasonal product. The dishes have each ingredient listed underneath it in calibri font. Other pertinent information about the product is also listed. The ingredients draw you in, and you begin to paint a picture in your mind of what each dish will look, smell and taste like. Your friend across from you likes the look of the rainbow heirloom beet salad with goat cheese, but has always been turned off by the texture of goat cheese. Your friend to your right is eyeing the black cod with smoked potatoes, but is going gluten free this month. You are thinking about ordering the pasta dish, but every time you order one in a restaurant you are disappointed because you "can make it better at home." Sound familiar? Food ordering has become a bit of a fiasco at times: ponder, debate, modify, substitute, order, panic about ordering wrong, changing order...yup- ordered wrong. You get the point. I know this feeling. The need to control exactly what ingredients from where are being put into my body. Choice is so important. Preference is significant. It makes sense as food is deeply personal. Individual taste and palates vary by experience, culture, nostalgia and traumatic food experiences (we've all been there). It's easy to approach a meal with a certain degree of "food baggage": predetermined notions of what tastes good together, what you don't like, and so on. External influences also play a major role. Two words "Food Trend" (I think kale may be ruined for me forever). Eating in China forced me to look at the food ordering experience in a new light. My husband and I were Western Canadian tourists navigating China on our own. We had no ability to speak the language, no tour guide, and no phone that could assist in translations- just hungry bellies and adventurous spirits. Half the time I had absolutely no idea what I was eating, and it was awesome. Never before in my life have I been so engaged and interested in my food. After we first arrived in Xi'an, the capital of the Shaanxi province in Central China, my husband and I wandered into a local spot looking for regional cuisine. We walked in and saw locals sitting at tables eating a variety of dishes, many of them eating some sort of stew. Raw meat and vegetables were spread on a table at the center of the restaurant and a chef was mixing up something that smelled delicious in a large pot behind the counter. We walked up to the counter and were greeted in Chinese. We apologized in English that we didn't speak Chinese. They responded in Chinese. We looked at each other and started motioning for soup. Blank stares. We were ushered to the till, and understood we were meant to pay. We paid. We were given an empty bowl, a thick dense unleavened flat-bread and were motioned to sit at the table. We sat down. Looked left, looked right- everyone else had full bowls of delicious stew and were completely immersed in their food. I looked at my husband and felt like a total idiot. After about 8 awkward minutes the server graciously came over and began motioning us to break up the bread into our bowl. We did just that. Unknowingly, we broke our bread into medium size pieces. For those of you that are beginning to deduct the dish I'm talking about you know that this is all wrong, it's all about the teeny tiny pieces for increased taste. I hope you give us a pass, as we were completely winging it at this point. The server noticed we had finished breaking our bread and motioned for us to approach the Chef with the big aromatic pot. Yes, finally! The Chef took our bowls and motioned for us to sit back down. We sat and waited. While we were waiting a friendly local man from a nearby table came over and greeted my husband in Chinese "Ni Hao" (Hello). He offered a beer to my husband and toasted his glass and said "Gumbai". We knew this one! We had just come from our friend's wedding which had been graciously hosted by their family in Jilin, Northeast China. "Gumbai" essentially means finish your drink or "bottoms up"; after a Chinese wedding we were all too familiar with this custom. Down it went. He spoke Chinese and we replied in English, we laughed and understood the intent. Finally we were summoned back up to pick up our now filled steaming hot bowls and we happily skipped to the table. So what were we eating? We were served a take on the local specialty in Xi'an- Yangrou Paomo (essentially crumbled flatbread in mutton stew) with a healthy serving of Offal in the broth to round out the dish. It was absolutely delicious. Check out those embarrassingly large pieces of bread! We realized our mistake afterwards as we began to explore the city and noticed groups of people sitting on boxes around crates chatting and slowly taking their time breaking the bread into the tiniest of pieces. I love how this preparation is such a big part of the overall experience of the dish. In China we became foodie investigators, what on earth did we order? Menus of course were in Chinese, and the majority of people we met spoke no or very limited English (at least where we were travelling and eating). For menus without pictures it was pure gamble. We just pointed at some Chinese characters and hoped for the best. If we happened to be in a restaurant that had pictures on its menu, it was quite helpful. Although... we never really knew what we were getting until we were eating it, and even then we still sometimes had no clue. We had fun tasting items and trying to figure it out. Eating this way is extremely liberating with no prejudgments based on ingredients. Eat it, see if you like it. Simple. Left: Rice flour bun that you stuff with delicious pork Center: we thought we were ordering a chicken dish but it was frogs legs instead. The dish on the right is a mystery to me, I remember it being incredibly spicy and tasty. Paying was another matter. In our observations hand signals were very different from Canada. The western classic "cheque please" handwriting gesture didn't help us in China . When sorting out the amount we owed, flashing ten fingers for ten did not fly. Instead to make the signal for ten: create an X with two index fingers slightly rotated (like a lowercase t). In southern China it is also considered polite to "bow" with two fingers by tapping them on the table. For example, when your tea is refilled you would tap your two fingers next to the mug and say "xie xie" (syeh-syeh) translated as thank you. We figured all this out as we went, by making fools of ourselves of course. 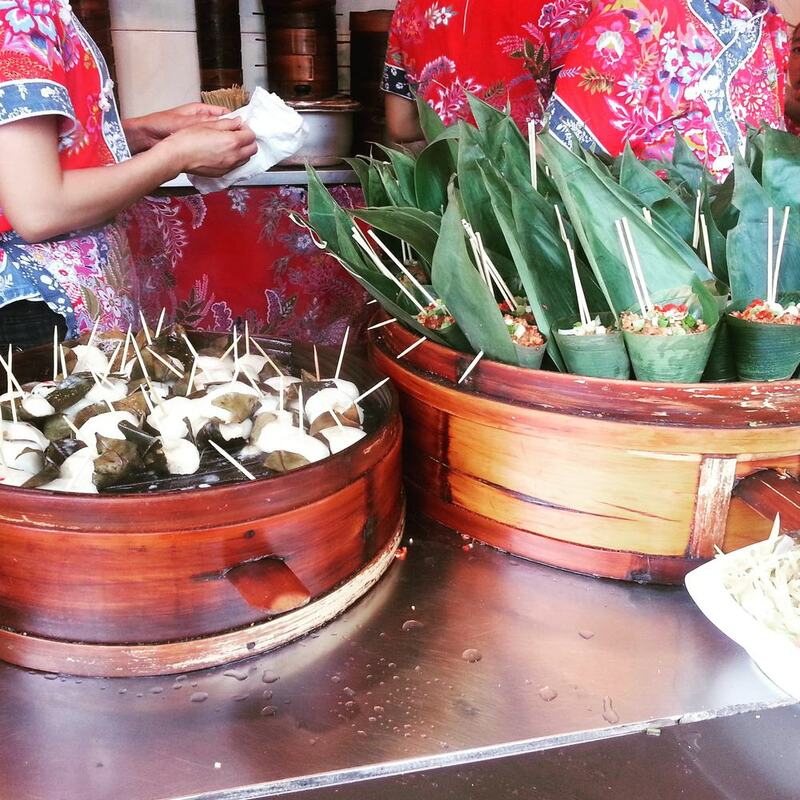 Street food in China: I'm in delicious foodie heaven. No restaurant reviews telling you where to go, just walk, taste and discover. The by far best way to explore local food. 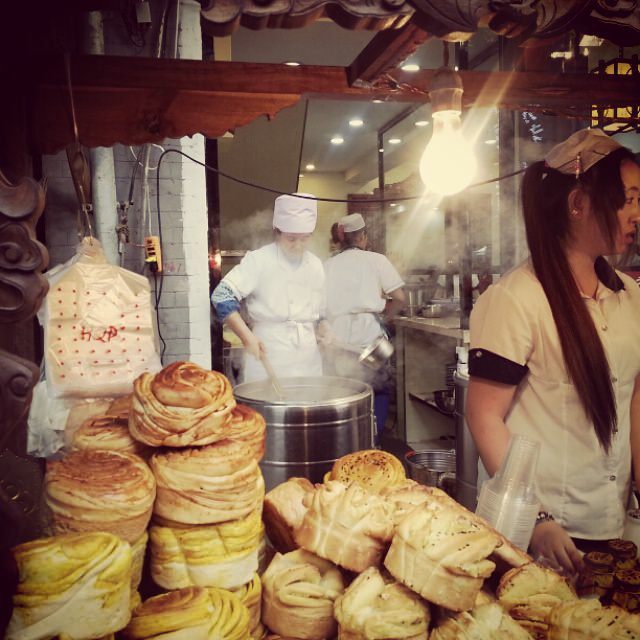 My Favourite Dish in Xian found in the Muslim Quarter: a hot noodle dish. Spicy, Sicuan peppercorns... Heaven. Miss this. This picture was shot in Chengdu. Chengdu is the capital of Southwestern China's Sicuan province. 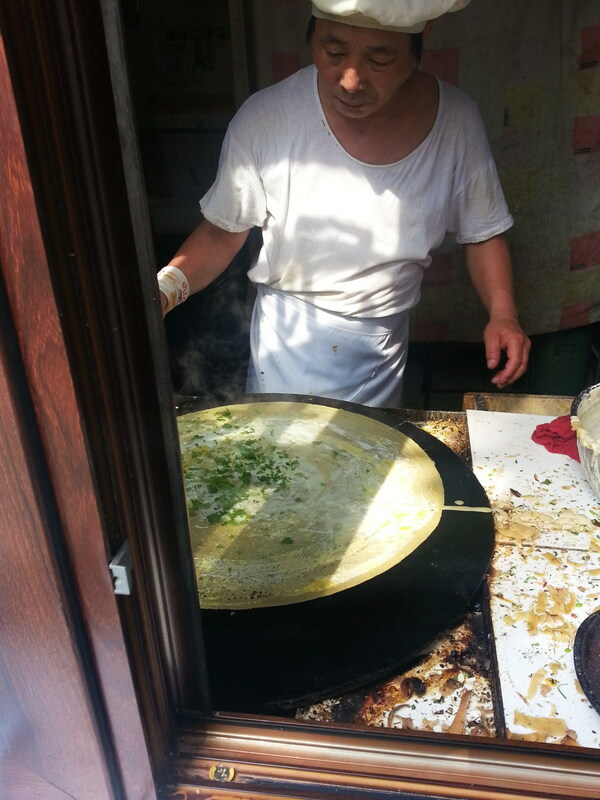 We loved Chengdu for obvious reasons- the city is famous for its spicy Sicuan cuisine. (I will go into their famous hot pot later). This little stall was tucked away on a street directly behind where we were staying. Two steamed buns cost RMB 1 (20 cents in Can. dollar) A real bargain and absolutely delicious. We would buy half a dozen each morning and sample as we dreamily explored the streets of Chengdu. There was a wide variety each day ranging from vegetables and different types of meat. The steamed minced pork bun was a definite favourite. 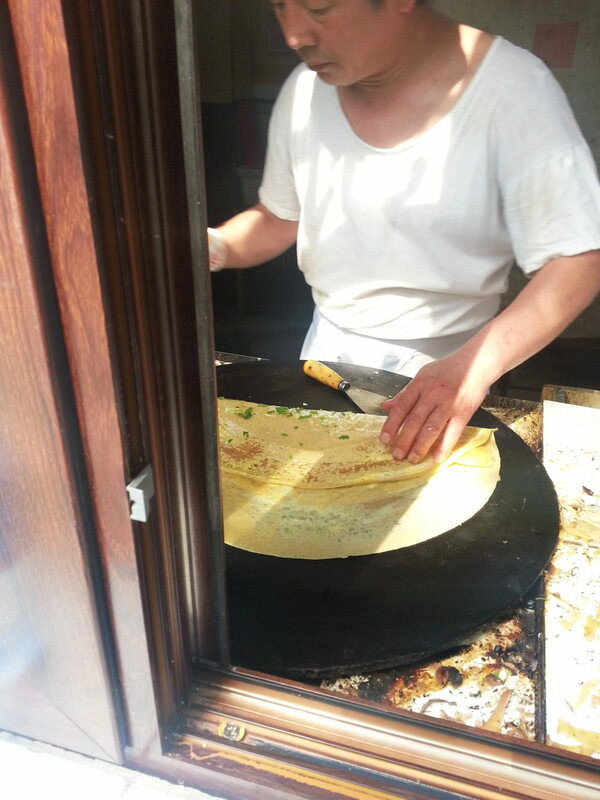 Below: Second Breakfast in Beijing- we found this little window tucked away on a side street in Beijing. Immediately after the window opened a line up formed. My husband and I had already eaten some steamed dumplings for breakfast. We looked at eachother, second breakfast? You bet. When someone says they are looking for "authentic Chinese food" it should be kept in mind that Chinese food varies greatly by region. Distinct cooking style is influenced by many factors including: geography, climate, agriculture, religion, dietary preferences, ethnicity, and local specialties. There are arguably many regional cuisines and food types in China including the eight distinguished regional cuisines: Sicuan, Cantonese, Shandong, Fujian, Jiangsu, Hunan, Anhui, and Zejiang. Other regional cuisines include: Northern Food, Xingjiang Muslim Food, Mongolian Food, Tibetan Food, Southern Minority Food, and Taiwanese Food. This variety is a true foodie dream come true! I feel like I just scratched the surface on this trip, I absolutely cannot wait for another opportunity to learn more about the different regional cuisines China has to offer. A side note: Chinese tourists are foodies on a whole another level. Watching the search for delicious street food is like watching elite foodie athletes (and I thought I loved food). 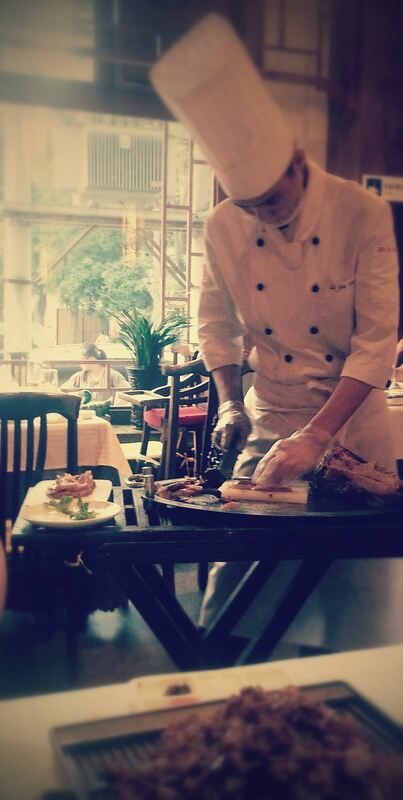 Eating Roast Duck in Beijing is an experience not to be missed. Besides being absolutely delicious. 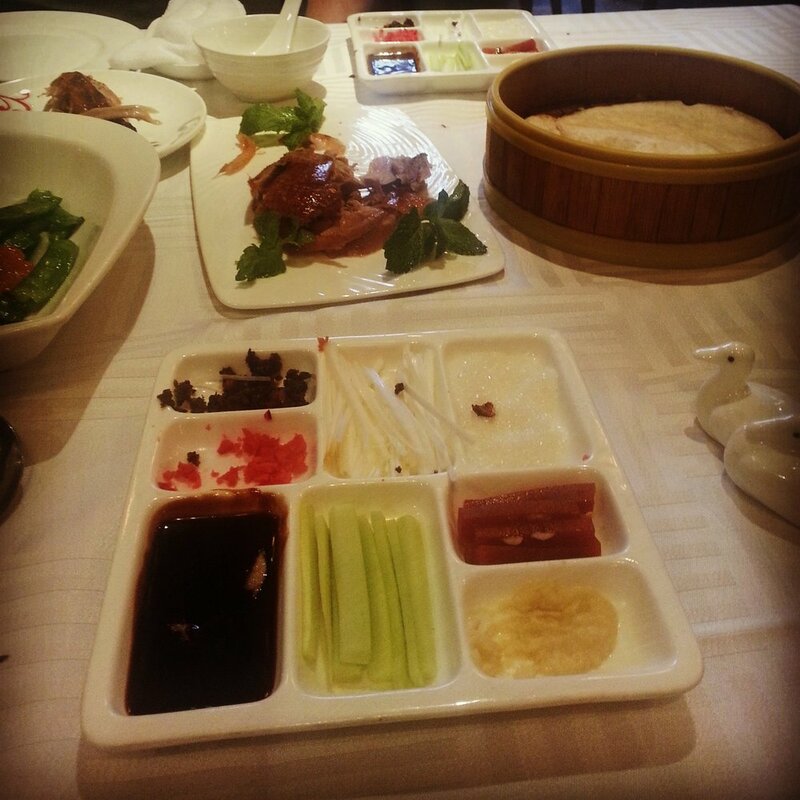 Beijing Roast Duck has a rich history and is the most famous dish in Beijing. According to legend this dish dates back to the Yuan Dynasty (1271-1368); hunted and roasted by the emperor. Many restaurants serve Peking Duck, but I would recommend finding a restaurant that specializes in this dish and serves it table side. We ended up at Siji Munfu and had a truly great meal. We traded in our seats on the curb and laps as our tables for white tablecloths and padded chairs and settled in. The staff modelled the correct way for us to eat the dish before our meal, so in this case we didn't have to worry about doing it wrong. After the chef carved the duck for us they recommended we dip the crispy hot duck skin in a bowl of sugar. Um. Yes Please! Like butter hitting a sizzling skillet, it melted in our mouths. The duck meat itself is wrapped in a wheat based pancake called bó bǐng using a special method before eating. Using chopsticks, pieces of duck are dipped in the fermented bean sauce and placed on the wheat based pancake. Mild flavored pickles, strong pureed garlic, sliced scallions and cucumber is also available to add to the pancake. The duck is wrapped via chopsticks- bottom to top and edges inwards. Now.. eat! Soooo good. Jiuzhaigou valley is a national park and nature reserve that we had the amazing opportunity to hike through in the Min Shan mountain range on the edge of The Tibetan Plateau. It is located in the North of Sicuan province, China and spans over 72, 000 hectares. A UNESCO world heritage site, the park boasts spectacular scenery with stunning mountains, multicoloured pools, waterfalls, and other natural wonders. Elevation ranges from 1,990 m to 4,764 m. The park is also home to nine Tibetan villages. The culinary scene is influenced by authentic Tibetan flavours and we were delighted to sample some delicious Tibetan style food after a full day of hiking (approximately 20 km in the morning alone). On the table: Yak meat dishes, dumplings, home-made bread and yak butter tea among other interesting delights. The opportunity to experience China's culinary scene in such a raw, adventurous way has truly impacted me and I am so grateful. I was able to approach each food experience with a blank slate. I felt almost childlike, as if I was experiencing food for the very first time. By going back to basics I became open to a whole new way of experiencing and loving food. Thank you to the local food proprietors I interacted with while in China. I do not know your names but will never forget your food. Thank you for sharing your beautiful craft with me and for putting up with all the hand motions, pointing and poor attempt at speaking Chinese. You are very patient. Through food we share life's moments. What's your food story? Feel free to leave me a comment in the section below, email me at gratitudeforlocalfood@gmail.com or follow me by Email, Twitter and Instagram. Gratitude For Local Food Love. Food. Stories. Note: In this post I am not referring to food allergies, only food preferences. Food allergy is a serious matter and patrons with food allergies should be accommodated when possible. If you have food allergies, eating in China may be a challenging experience for you unless you speak the language or have a translator with you.